Sting is one of the few musicians out there who can put out an album like Symphonicities and have it make sense. 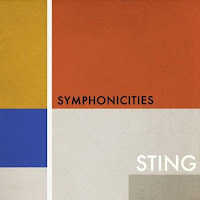 Always one to mix an outstanding knowledge of musical theory with passionate creativity, Sting reworks some of his best songs with The Royal Philharmonic Concert Orchestra for this imaginative album. Of the twelve songs, four are from his days in The Police, eight are from his solo work and all of them take on a new feel within this orchestral context. Instead of just adding some strings here and swapping out a woodwind for a guitar line there, Sting actually recreates new textures and moments around his already familiar melodies and lyrics. Symphonicities opens with “Next To You,” which is coincidentally the same song that kicks off The Police’s first album, Outlandos d’Amour, from 1978. Impressively matching the intensity of the original without traditional drums or electric guitars, Sting puts to rest any assumptions that this concept might lead to stuffy, uptight recreations. This upbeat, unconventional energy is revisited throughout the album in songs like “The End of the Game” and the frenzied “She’s Too Good For Me.” When he does slow it down, the sweeping ballads are opened up even more in songs like the beautiful “When We Dance” and the haunting “You Will Be My Ain True Love.” The two songs that probably deviate the most from the originals are both well known and well loved Police songs. “Every Little Thing She Does Is Magic” is carried by plucked strings and a nice percussion bed and “Roxanne” is much more brooding with a vibraphone and a lower register for Sting to sing in. There are a few songs that already have orchestral elements in the original versions and these are the ones where Sting might run the greatest risk of criticism for phoning it in. However, a close listen will prove that fresh, new elements have been added to the standard arrangements. “The Pirate's Bride” as a duet sounds like it was reimagined for a dramatic stage presentation, the mixed metered “I Hung My Head” has a variety of melody lines weaving throughout it and one of my favorite songs from Sting’s solo catalog, “Englishman In New York,” sounds even more bouncy and soulful than the original. My one small gripe is that when I saw this song on the tracklist, I was sure that I would finally get a version without that weird, out of left field drum break that comes in after the jazzy instrumental bridge. No such luck. It’s still included here, although done with symphonic percussion, of course. Overall, this album is a great listen and it’s inspiring and entertaining to hear Sting successfully pull off different variations of his songs that were already filled with such identity and musical complexities. Symphonicities will be released on July 13th.